The 21st Century learner is the ‘moral purpose’ (Stiegelbauer, Fullan & Hopkins) for school transformation. The strategic aspiration is to provision online learning that empowers students to become ‘confident and capable global citizens’. The moral purpose of improvement is to develop a teaching and learning service which supports the 21st century learner to become confident and capable global citizens. This overview introduces and reflects on the implementation of teaching and systems strategy of reform and innovation. 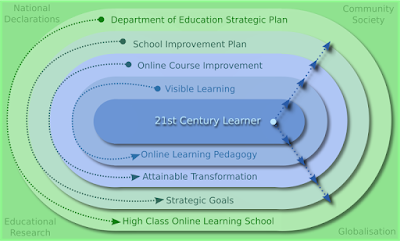 The strategy is to shift learning programs from a print ‘n post didactic transactional service to a collaborative high class online visible learning methodology. Department of Education Strategic Plan. National Declarations (including Professional Standards and Curriculum). Community and Society (Expectations (and change). National agreements Educational Research, Community and Globalisation. Globalisation (Workforce Skills - capable and confident). When all of the structural and organisational agents are focused in the same direction, then the aspirations of school improvement have much more chance of success (Hopkins). 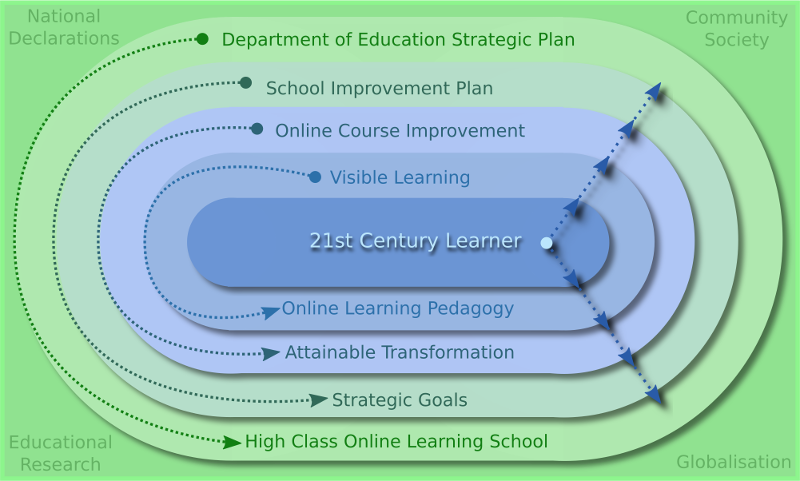 21st Century Learner is core to the improvement of learning programs. The learning program improvement plan’s 'essential focus' is to support differentiated, engaged student centred and collaborative learning activity within the expectations of curriculum requirements. Inclusive and intrinsically motivating learning materials/activities. This is a whole-of-school learning program improvement plan. The journey of improvement involves all teachers. Quality online teaching and learning relationships. Quality standards and expectations of employing online technologies. Bronze to Platinum learning programs. Implementation of school vision and improvement plan. Support of teachers to implement school improvement plan. Enable teachers to employ whole-of-school improvement actions within individual professional enhancement plans.